WDA provided full design, engineering and permitting services for the redevelopment of the former 56-acre Bay State Abrasives industrial complex into a new, state of the art mixed-use “lifestyle” center. 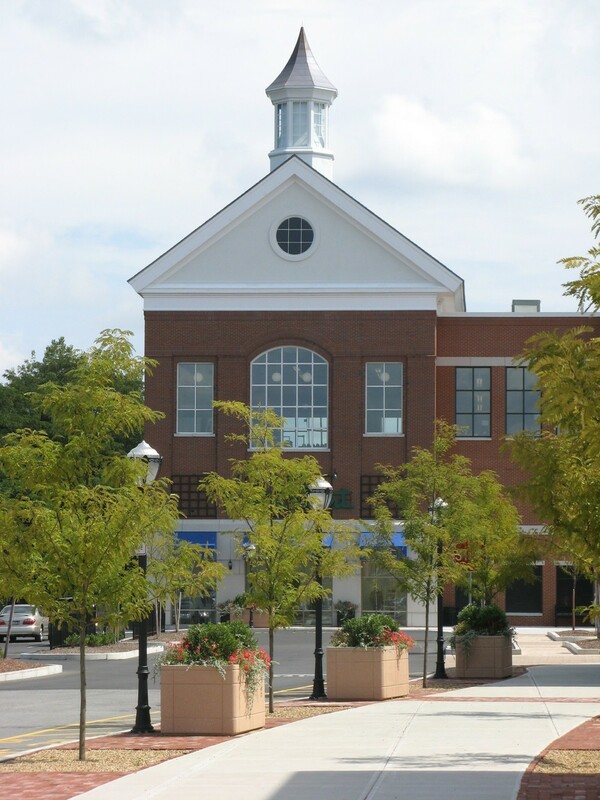 The project, which is integrated into the central village in Westborough, MA, directly adjacent to the downtown rotary, is designed to create a vintage “Main Street” shopping experience by developing a unique streetscape and architectural identity that reflects the existing central village community. Generous 12’-18’ wide sidewalks line the buildings, with streetscape edge treatments including brick pavers, large raised planters filled with lush annuals, period lighting, and street trees in oversized tree pits, all designed to create a strong edge condition along the roadway to clearly define the pedestrian corridor. Traffic calming measures such as 20’+ wide raised crosswalks cast in stamped colored concrete further define and enhance the pedestrian-oriented circulation. The property was previously classified as a brownfield site by DEP, therefore pre-development remediation measures were necessary. Those measures included leaving all of the existing building foundations in place, and importing nearly one million cubic yards of fill material to raise the grade of the entire site by over 3 feet. Furthermore, to the greatest extent practicable, the existing utility infrastructure was reused to minimize disturbance to the subsurface conditions. As part of the overall mixed-use development, which included over 350,000 square feet of retail space as well as a 44 unit luxury condominium development, a new 2.5 acre public park was designed adjacent to the main entrance to the center. The park design is separated into three distinct areas, all of which are connected by a series of wide walkways. WDA’s services included overall master plan development, landscape architecture, site engineering, re-zoning, and permitting.